In Paris, “Fondation Cartier pour l'art contemporain” presents the first solo show by an interesting young Japanese architect, Junya Ishigami, until June 10. 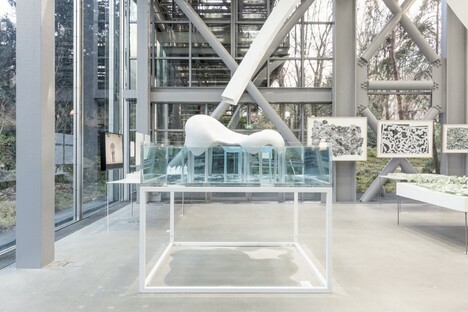 The exhibition, entitled Freeing Architecture, is the first architecture exhibition held by Fondation Cartier, a foundation established to promote all forms of contemporary art. Japanese architect Junya Ishigami, who was awarded a Golden Lion at the 12th Architecture Biennale in Venice in 2010, curated by Kazuyo Sejima, belongs to the young generation of Japanese architects who rose to success after the year 2000, and was recently the subject of a major exhibition at MoMA in New York. Landscape plays a key role in the Japanese architect’s work. The environment around his projects becomes an integral part of them, as in the artificial lake in Rizhao, China and the transfer of more than three hundred trees in Tochigi forest in Japan. The exhibition is conceived as an architectural project, taking over the iconic building designed by Jean Nouvel for Fondation Cartier and Lothar Baumgarten’s garden outside it. Visitors follow a winding route, discovering a different landscape and a new perspective on the architect’s work in each room, grouped according to “elective affinity”. The exhibition presents a total of about twenty architectural projects in Asia and Europe through videos and drawings documenting various stages in design and construction, and above all in large-scale models. These are not models for design and study, but objects made specifically for the exhibition, which create a variety of different moods in the open spaces of the Fondation Cartier, free of dividing walls: solemn, dreamy, playful or calm. The variety of the projects on display - schools, a church, a museum, a home, a park, a restaurant, etc. – demonstrate the wealth and complexity of Japanese architect Junya Ishigami’s work. Projects whose simplicity and poetic approach conceals true technical challenges and reflection on the human role in architecture. Maxxi in Rome is holding an exhibition to celebrate the centenary of the birth of Bruno Zevi, an important architecture theoretician and historian whose multi-faceted career and critical, civic and political commitment made a very important contribution to architecture all over the world throughout the twentieth century. Material from the archives of Maxxi Architettura, Fondazione Bruno Zevi and other important Italian national and private institutions is presented in an exhibition including publications and audio and video documents by the famous academic, as well as projects by 38 architects whom Bruno Zevi chose to support and promote, including Carlo Scarpa, Pier Luigi Nervi, Franco Albini, Maurizio Sacripanti, Piero Sartogo and Renzo Piano. Bruno Zevi himself speaks of his multi-faceted career in audio documents and written words. The exhibition installation recreates a big studio with tables and bookshelves in which the academic’s presence is palpable, in the form of well-known quotes and photographs on the walls as well as videos, books and magazines reflecting his interests. On the tables are drawings, models and visual materials pertaining to the work of the 38 architects involved. The exhibition route is divided into three main levels of narration: the first is an illustrated biography of the academic, reconstructed through his own words and actions, followed by a selection of projects and architects he published and commented on, and a third section regarding his work in communication about architecture and as curator of famous exhibitions, such as the 1964 exhibition about Michelangelo with Paolo Portoghesi in Rome and the Anti-classical Brunelleschi exhibition in Florence.